For as long as I can remember, I had the wish to cycle on the Lofoten, and this year this wish finally came true. And only because we couldn’t really find another trip to go on during the holiday break. 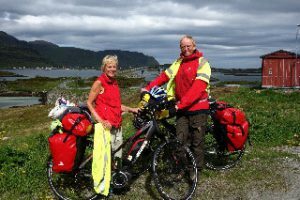 Through Abel Travel’s employee Daan Remijnse we learned about an e-bike tour of 650 kilometres across Senja, the Versterǣlen and the Lofoten. What drew us to this type of travelling high up north in Europe was the pioneering and finding peace, serenity and authenticity. Expecting hardship and bad weather, we left for Tromsø to rent the bikes. Our trip took place in June and we went just above the arctic circle so we experienced daylight 24/7 that month. We rented the e-bike at Tromsø Outdoor. We were warmly welcomed, they showed interest in us and provided thorough instructions that showed us they knew their business. They had prepared a Merida bike for us; a sturdy and well assembled and adjusted bike with wide tires. We also received a safety vest, helmet and helmet light with limited range, so our safety was covered. The e-bikes we rented definitely were of the same quality as our Cannondale e-bikes we have at home: Magura disc brakes and a Shimano intuitive centre-engine. The battery had sufficient power for the whole tour. There was one very steep climb on the Senja that emptied the battery, but we were able to charge it at a shop while waiting for the ferry. Unfortunately our luggage had been left behind at Schiphol airport leaving us without enough clothes for a long tour in the arctic climate. 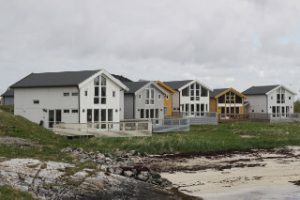 So our first trip by bike was on a bus across the island of Kvaløya to our first accommodation, a fisherman’s cabin on Hillesoya. The busses in Norway allow you to take your bikes on the bus as luggage. The cabin in Hillesoya was beautiful, luxurious, spacious, had a sauna and was located at a small beach. The bus driver told us with a big grin on his face that they call it a ‘funny beach’: beaches perfect for short sweet summer love affairs. Our cabin at the beach of Hillesoya. What items to bring on your travels? The packing list provided us with advice which we eagerly followed. It made us specifically focus on warmth and safety: proper warm (thermal)clothing, an appropriate first aid kit, lights and even a whistle. Make sure to also keep the Norwegian weather in mind. A well-known Norwegian saying goes “bad weather doesn’t exist, bad rainwear does”. My advice would be to pack light. Everything that fits in two side bags per person should be enough. We both had an Ortlieb rack pack on top of the side bags and we were too heavily packed. On the third day we reached Senja after a crossing by ferry. This truly is the wilderness; savage, pure and unkempt. A rugged landscape, impressive coves, mountain lakes and snowy mountains; you’ll all find it there. Outside of Norway, people don’t really know Senja. We do look at it as the perfect tourist destination though, exactly because so few people know about it. Every now and then a car might pass, but that’s it. The mountains are high and pointy and covered in snow. The roads are mainly coastal but we also took some roads through the mountains and even had a few very steep climbs. With a little extra support from the e-bike this turned out to be very doable. Before we left on this trip, we were rather worried about the tunnels on Senja though. The first tunnel we had to go through was two kilometres long. We turned on our bike and helmet lights and pressed the button before entering the tunnel to warn oncoming cars there would be bicycles in the tunnel. The tunnel was actually lit quite well and had moderate road conditions. 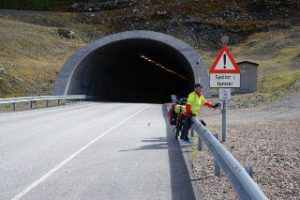 It was the longest tunnel we’d go through and it turned out to be very ok. Senja is the only place we had a hotel booked. An authentic resilient fisherman’s hotel that can be compared to a three star hotel. We have seen ghosts and trolls in Norway! 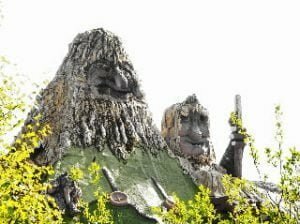 A troll reserve, Senjatrollet, and a museum with dwarfs and giants with one, two or even more eyes, and sometimes even with multiple heads. The trolls also live in the wild though, gigantic eyes and noses in rocks, stern looks with eyes sunken deep into the face. They can be affectionately recognized as gnomes in branches and tree trunks, forever accompanying us on the many kilometres up and down the mountain. We were prepared for long bike tours and had packed accordingly. Being from northern Holland, we are able to withstand the cold and wind, so we also packed shorts, thinking they would be ok to wear during summer high up north. At least, that’s what we thought. Thankfully we had also packed clothes for worse weather such as cold, rain, hail and wind. On the days we had bad weather we had to wear multiple layers on top of our shorts, including rain wear. You could say we experienced all seasons in one trip, except for snow and frost. We even saw tulips, daffodils and grapes in full bloom. The only mosquitos we had to deal with were on the Versterǣlen along peat lakes that were along the route, but we never got bitten by them. Our first night spent on the Versterǣlen was in a fairy tale-like cabin in Bleik. I would have loved staying another night here to watch the birds, puffins and sea eagles. The sea around Bleik is supposed to guarantee whale spotting, but I think we might have been too early in June to spot them. The Versterǣlen are slightly more cultivated and inhabited and people keep live stock. 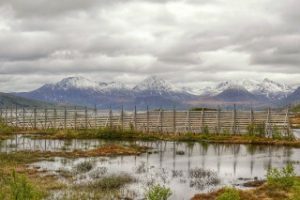 It was quite odd to come across a fenced off house with some cattle and a sign that says ‘no entry’ when the rest of the landscape is so vastly open. We even noticed a chained off path with a dilapidated campervan behind it. Really quite strange. We spent most nights in fisherman cabins. There was one night we spent in a fisherman cabin at a five star hotel. As to be expected from such a hotel, it was a very luxurious cabin. 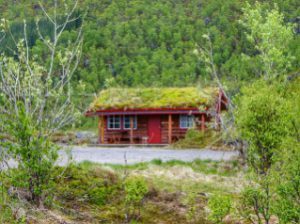 We also spent two nights in a hiker’s cabin near the fresh water lake at Stamsund. There were quite a few defects in the cabin, but the friendliness and helpfulness of the owner’s daughter more than made up for that. It was like good old fashioned camping, but we could have done with lights and a shower with underfloor heating (something all the other cabins did have). Seriously, what a massive treat, to have warm feet in the shower! The best invention ever, and if you ask me, a must for every single place, also in the Netherlands. We were happy to be able to cook by ourselves in every establishment, except in the hotel rooms. The restaurants have a small menu with excellent dietary notifications. Alcohol is very expensive and heavily taxed. By cooking food yourself, you are able to try something else than the small menus have to offer which include mostly fish and meat and very few vegetables. The supermarkets have plenty in stock so you can cook all sorts of meals from worldly cuisines. At first glance, Norway isn’t really the cycling type of country. In the Netherlands we are used to having separate cycling lanes and signed bicycle routes. Safety is guaranteed through rules and facilities in Norway. For example, a car will stop when a cyclist is crossing, a car will leave plenty of room when overtaking a cyclist from behind and a car will slow down considerably while passing so as to provide safety for the cyclist. Only once were we cut off by a car, but this turned out to be Dutch people. 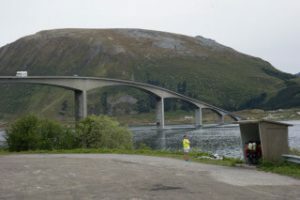 We were a little apprehensive of the E10, the main road on the Lofoten, but it turned out to be fine. We never felt unsafe being on the road with passing motorists. 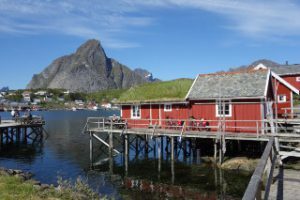 The Lofoten are a tourist highlight and has been discovered by people from all over the world. We of course met with locals, but also with Germans, Americans, Chinese, Japanese, Swiss, Spaniards and Belgians. It was a hustle and bustle of itinerant tourists. To illustrate, we saw a colony of no less than 17 campervans on the E10. Despite the crowds, the Lofoten was definitely worth it. 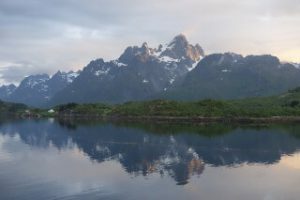 And we certainly don’t regret prearranging an extended stay in Nusfjord and Reine. 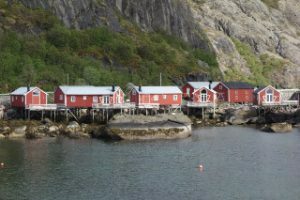 Both towns are very authentic fisherman towns that stand out because of their wooden architecture. We could have done with planning a few extra free days here instead of in Stamsund. Back in Stamsund after a bike tour of 70 kilometres from Reine, we checked in on the Hurtigrutten, the famous mail boat, that took us back to Tromsø. 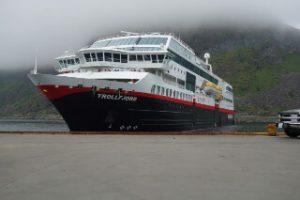 The ship The Trollfjord took people and freight from one port to another, but had become a real cruise. 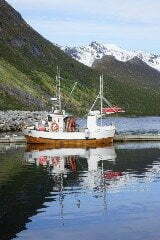 It was nearly impossible for the helmsman to get his ship through the Trollfjord (same name as the ship). People would applaud him for being able to do it. But the applaud wasn’t as loud as the music from the Peer Gynt Suite from Grieg. Such strange music! 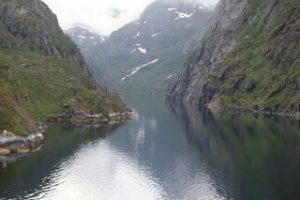 We had cycled the Peer Gyntvegen, a path a few hundred kilometres from this fjord. We handed in our rental bikes at Tromsø Outdoor as soon as we were back in Tromsø. The bikes had been great to us. We never once had to use the toolkit, didn’t suffer any punctures nor any technical failures. 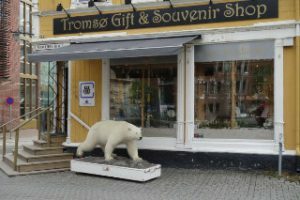 Strolling through the shopping streets of the town, we recognized some fellow travellers from the Hurtigruten. Right behind the bike shop was a souvenir shop. They had a polar bear standing outside of it. This would be the polar bear mentioned in the novel ‘Nooit meer slapen’ written by W.F. Hermans, but the people on duty in the shop didn’t know about it. The polar bear had only been there for two year according to them and came from Alaska. .Aartje and Roel Bax, June 2018.